Involtini. It’s an Italian culinary term that I like to think of as describing something delicious wrapped around a filling that’s even more delicious. 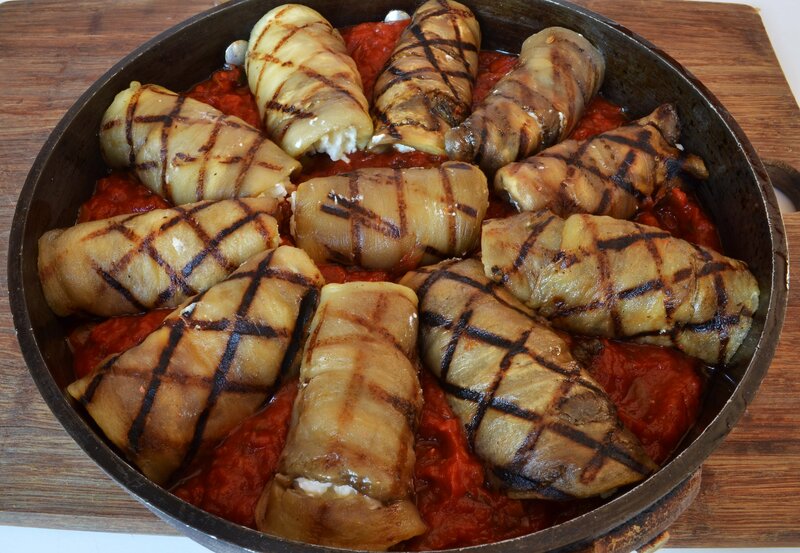 That pretty much sums up Eggplant Involtini, or Eggplant Roll-Ups. For this recipe, eggplant slices are blanched, grilled, and then rolled around a smooth and cheesy mixture that sits in a shallow bed of sauce. Use your favorite store-bought red sauce or try my momma’s quick recipe for homemade marinara! Preheat oven to 350ºF. Slice the eggplant lengthwise into about ¼" slices. Cut off outer purple skin. Add the salt to pot of water and bring to boil. Prepare a shallow baking sheet by lining it with paper towels. Drop several slices of eggplant into boiling water and cook for 4 minutes, or until eggplant begins to soften and darken. Remove with a slotted spoon and let drain on paper towels. Continue this process until all eggplant slices are blanched. Heat a grill plate to high. Brush each eggplant slice with olive oil. Place slices on grill and cook until grill marks appear. Very gently remove the slices from grill and set aside. In order to make the filling, in a medium bowl, mix together the ricotta, parmesan, mozzarella, egg, and salt, stirring to combine. Spread 2 cups of marinara sauce in the bottom of a shallow casserole dish or deep dish pie pan, reserving ½ cup of sauce for top. Spoon about a tablespoon of filling on one end of eggplant slice. Roll it up and place on top of the sauce in the dish, seam side down. Continue to make roll-ups until all filling and eggplant slices are used up. Spoon the remaining marinara sauce over top of roll-ups. Sprinkle with ½ cup each of Parmesan and mozzarella sauce. Bake for 25 minutes. Serve hot. In a saucepan over medium high heat, sauté onions and garlic in oil until golden-brown (do not burn). Add the remainder of the ingredients except salt and pepper. Cook for about 20 minutes. Add salt and pepper at the end of the cooking process.